Dr. Elaine Atkins Harriss, Professor of Music at the University of Tennessee at Martin, is a pianist, flutist, and early childhood music specialist. She received her Bachelor's and Master's degrees from Peabody College of Vanderbilt University and her Ph.D. from the University of Michigan. 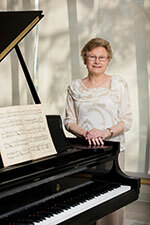 Dr. Harriss has been at UTM since 2001 and served the Department of Music as chair for six years. Dr. Harriss as a pianist is well-known for her solo and collaborative playing and has extensive piano duo, duet, and eight-hand experience with her partner Allison Nelson. Recent performances included Gershwin’s Rhapsody in Blue with the UTM wind ensemble at the Canon Center in Memphis and “Piano Music of Poulenc,” featuring L’Histoire de Babar with narrator Interim Chancellor Dr. Robert Smith and Sonata for Two Pianos assisted by Dr. Johnathan Vest. She is currently pianist with the University Trio. Elaine's flute performing included 25 years as principal flutist with area orchestras, 18 years of chamber work as flutist with the University Trio, many solo recitals, and the premier of Sam Ewell's Ramble for Flute and String Orchestra. To serve the musical needs of the community, Dr. Harriss maintains a pre-college music studio, and for 19 years directed Kindermusik of Martin which served over 1,500 children birth through age seven. She was Director of Educational Standards and Professional Development for Kindermusik International of Greensboro, N.C., for many years and served as president of the International Kindermusik Educators Association from 1999-2003. Dr. Harriss has taught over 50 workshops on five continents and has made presentations at meetings and conventions of the National Piano Pedagogy Conference, the Music Educators National Conference, the Kindermusik Educators Association, the Australian Kindermusik Educators Association, the Hawaiian International Conference on Arts and the Humanities, and the Tennessee Music Teachers Association. She was named Tennessee Music Teacher of the Year by the TMTA, is a past president of that group, and now serves as the state competition chair. In 2013 she was named a Foundation Fellow by the Music Teachers National Association. Dr. Harriss is also a past president of the Tennessee Federation of Music Clubs and currently serves as president of NFMC's Martin Philharmonic Music Guild. Dr. Harriss served as the 2007-08 president of the UT Martin Faculty Senate, the 2013-14 president of Phi Kappa Phi, and as a past member of the Martin Historic Zoning Commission and the Martin Beautiful Committee. She is president of the Martin Area Music Teachers Association and an advisor to UTM's Sigma Alpha Iota chapter (music fraternity for women), She and her late husband Ernie Harriss II have two sons and a daughter-in-law, Ernie Harriss III, and Edward and Elana Harriss, and three grandchildren, Blase Edward Harriss, Ronin Atkins Harriss, and Ella Louise Harriss. Elaine is an elder in Trinity Presbyterian Church and serves as pianist for Trinity services.